Free FTP Client is a Windows-based File Transfer Protocol (FTP) application that allows you to utilize the capabilities of FTP without having to know all the details of the protocol itself. Manage WordPress blogs easier with free Comment Client for WordPress. 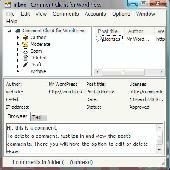 View, edit, delete, and moderate comments without opening a Web browser. No lengthy delays and no need to open WordPress every time you need to approve or flag a comment as spam! Free FTP Client for home and business with multiple connections, scheduled jobs , command line options, quick history connect, log viewer, optional automatic PGP encryption/decryption, Secure FTP connections and much more! jafoClient is a free and useful client for the Uptimes Project that runs as a Windows service. It includes a tray application to interact with the service (stop/start it) and display statistics gathered via XML from the Uptimes server and Event Log. FrostWire is a free Gnutella client based on LimeWire distributed under terms of the GPL . WinSCP is an open source free SFTP client and FTP client for Windows. FAR Manager is an open source text-mode program for managing files and archives. WinSCP plugin adds SFTP/SCP support to the manager. You don´t need any additional TV-Card in your PC oder notebook. You just need an ordinary internet conntection. LoadPlanner Desktop is a free application client and a GUI component of the Enterprise, Client/Server, and Application configurations. - Intuitive, spreadsheet-based professional grade GUI with dynamic help. - Interactive 3D graphics with animation and step-by-step controls. Desk SMS is a free desktop client to send free SMS message via your Google account. Desk SMS is a Free desktop Client to send Free SMS message via your Google account. The application allows you to loginto your google account and send Free SMS to any US mobile number. This application will act as a chatting Client and will also show you any incoming message. MyZilla is a free desktop client for Bugzilla bug tracking system. MyZilla is a Free desktop Client for Bugzilla bug tracking system. By providing the means of working with a desktop application, it increases the productivity of all project members. - Http basic authentication implemented. - Access bugzilla server configured on different port that the standar one. The new free TmoleX Client version is designed to run TURBOMOLE on remote Linux/Unix systems from your local Windows, Linux, or MacOS desktop. TinTin , aka tt , is a free MUD client for Mac OS X, Linux, and Windows. TinTin , aka tt , is a Free MUD Client for Mac OS X, Linux, and Windows. The Windows port named WinTin (using the PuTTY derived mintty terminal) is available for those who do not use Cygwin (A Linux/Unix emulator for Windows) and runs on Windows Xp, Windows Vista, and Windows 7. Besides MUDs, TinTin also works well with MUSH, Rogue, BBS, and Linux servers. FSXFollow connects to the flight simulator directly through our free PC client. FSXFollow connects to the flight simulator directly through our Free PC Client. FSXFollow saves valuable screen real-estate on your desktop by using your iPhone, iPod Touch or iPad to display your aircraft's current position. You can see the Flight simulator's screen on your device. MySQL Sidu is a free MySQL client working via web browser. .
FlashfxpPasswordDecryptor is FREE software to instantly recover FTP login passwords stored by FlashFXP - most popular FREE FTP client application. .
FlashfxpPasswordDecryptor is FREE software to instantly recover FTP login passwords stored by FlashFXP - most popular FREE FTP client application. FilezillaPasswordDecryptor is free software to instantly recover FTP login passwords stored by FileZilla - most popular FREE FTP client application.